It's hard to imagine Holland without its lush green pastures and black-and-white Frisian cows. These have become as much part of the clichéd Dutch identity as clogs, windmills, and tulips. The Dutch have been making cheese since 400 A.D. Nowadays, the Netherlands is the largest exporter of cheese in the world, with a dairy industry valued at over 7.7 billion Euro. This overview is by no means exhaustive but offers a look at the most important types of Dutch kaas (cheese), as well as a few varieties that are worth seeking out. Almost half of the cheese production in Holland is devoted to this iconic cheese, making it the Netherlands' most important and best-known cheese. Gouda is a semi-hard cheese with a 48 percent milk fat content and a mild to piquant taste. Aging intensifies the flavor and hardness. Gouda usually comes in cheese wheels weighing 26.5 pounds (12 kilos) and Baby Goudas usually weight half a pound to a pound (250 g to a kilo). Beemster, Reypenaer, and Old Amsterdam are popular commercial brands. Within the Gouda family, there are many varieties. Graskaas is made from the first milkings after the cows return to the grassy polders from a winter spent inside. The fresh spring-time grasses lend the 1-month-old cheese a rich, creamy texture and naturally yellow color. When graskaas is only aged for up to 1 week it has a milky color and is called meikaas. Jonge kaas (aged for 4 weeks) and jong belegen kaas (2 months) are well-suited for sandwiches and go great with Dutch grain mustard. Other Goudas are fantastic for cooking; try extra belegen (aged for 7 to 8 months) if you're looking to substitute Jack or Cheddar cheeses. The oldest varieties, such as oude kaas (aged for at least 10 months) and overjarig (1 to 2 years), are excellent for eating in crumbly shards with a drizzle of Dutch apple syrup. Boeren Goudse Oplegkaas, an aged artisanal Gouda, is made in the summer from the milk of grass-fed cows and aged for at least one year and up to four years. Use Gouda cheese to make beer & bacon bread. Edam cheese is the second most important cheese in the Netherlands, making up 27 percent of the country's total cheese production. It is semi-hard, with a fat content of 40 percent and a very mellow, salty taste. Aging intensifies the flavor and hardness. The cheese has a typical round shape and many export versions often have a red paraffin coating. A regular Edam cheese weighs 4 pounds (1.7 kilos) and baby Edammers weigh half a pound (1 kilo). Westland exports good Edam cheese, but whatever brand you buy, make sure it is from the Netherlands, as many imitations taste nothing like the real thing. Sticklers for authenticity should try to track down raw milk Boeren Edam from De Weere. 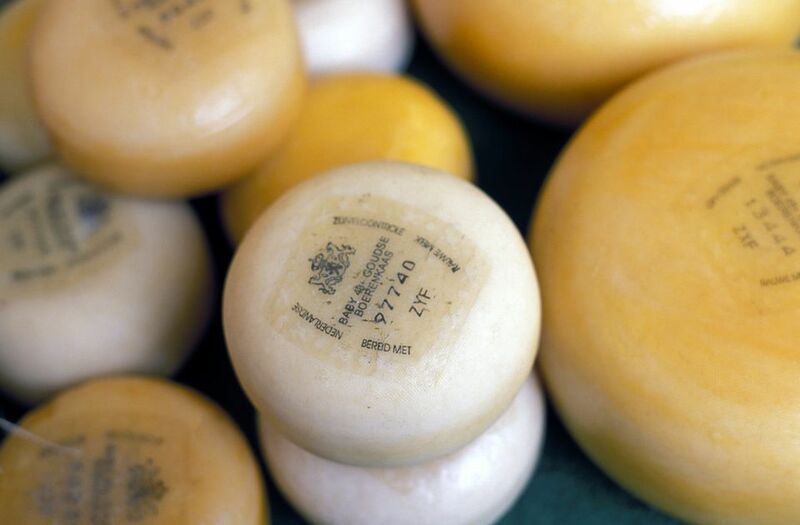 Maasdammer cheese represents 15 percent of Dutch cheese production. It has large holes, a domed shape, and a sweet, nutty taste. The shape, typical taste, and holes are created by special bacteria that release gases during the maturation process. Leerdammer and Maasdam are the best-known brands of Maasdammer cheese. The city of Leiden was once known for its butter industry, and Leidsekaas was originally made from skim milk, a by-product of butter production This type of cheese has a lower fat percentage than Gouda cheese, generally ranging from 20-40 percent. The low-fat, dry, and salty nature of this cheese made it exceptionally well suited for long ship voyages to the East in the 17th century, where it could be easily stored without refrigeration for long periods of time. It is thought that cumin seeds were added to counteract the salty taste. The original cumin cheese from Leiden is crumbly, piquant, and somewhat tart. It is aged for at least 6 months. Further aging intensifies the cumin flavor. Because of the differences in fat percentage and its EU Protected Designation of Origin (PDO), not all cumin cheeses may be labeled Leidsekaas. In fact, some cumin cheeses are simply Gouda with added cumin seeds. Use cumin cheese to make scrambled eggs with baby kale & cumin cheese. Boerenkaas (sometimes called "farmhouse cheese") is a handcrafted raw milk cheese. By law, at least half of the milk used in the production of boerenkaas should come from the farm's own cattle. The other half may be purchased from no more than two other dairy farms. This ensures an artisanal product. The Netherlands does not have an extensive variety of soft cheeses; most innovations are a twist on existing styles. There are a few exceptions, including Le Petit Doruvael, which is decidedly Dutch despite its French-sounding name. This washed-rind cheese from the Utrecht province has a distinctive smell, orange rind, and ooey-gooey texture. It combines well with vijgenbrood (a flour-free ''bread'' made simply from dried figs, nuts and spices). Another famous washed rind cheese, known as rommedoe, has all but died out in the Netherlands due to strict regulations by the Netherlands Controlling Authority for Milk and Milk Products. Fans of this rich, pungent soft cheese can still find it in Belgian Limburg cheese. This tangy, firm-textured cheese is studded with cumin seeds and aromatic cloves. It is native to the northern Dutch province of Friesland. This style of cheese is made with skim milk and has a fat percentage of 20-44 percent. One type is kanterkaas, which is angular on one side and round on the other. Other styles of clove cheese are called Friese nagelkaas or just nagelkaas. Kanterkomijnekaas is flavored with cumin. Use clove cheese to make our Frisian onion soup or warm chicory salad with Frisian clove cheese. Late one fall, lower temperatures, higher humidity levels, and fatty milk caused a batch of Edam cheese to "flop," this mild-flavored, creamy, and sticky-textured ivory cheese came about as a happy accident. Traditionally native to the Noord Holland province, the 200-year old recipe for what used to be known as messenhanger was almost lost, as production halted after World War II. Luckily a few producers have started making this cheese again. Because a large Dutch cheese manufacturer owns the patent to the old name, it is now known as messenklever. Dutch goat's cheese is available as the familiar fresh, soft goat's cheese and in the semi-hard Gouda-style. The advantage of this goat's cheese is that it needs a shorter maturation process than cheese made from cow milk. Semi-hard goat's cheese is pale, with a slightly piquant taste, but a creamy melt-in-the-mouth texture. Kobunder Natuurkaas is a type that is rubbed with Dutch apple syrup and aged in an old peat barn, which results in a cheese with a puce-colored crust, crumbly white interior, and notes of fruit and smoke. Also worth seeking out are Picobello, a superb raw milk organic aged goat's cheese from Heeze, Machedoux, a mild, sweet raw milk goat cheese from Groningen province, and organic aged Rouvener goat cheese, with its characteristic caramel tones and nutty flavor. Perhaps the most famous Dutch sheep milk cheese comes from the sheep-studded island of Texel, where the cheese-making tradition goes back at least 400 years. The sheep graze on salty sea breeze-blown meadows, which give the delicate cheese its unique flavor. Other notable Dutch sheep's milk cheeses include herby, caramel-toned Breelse schapenkaas and Veerse schapenkaas, made from the raw milk of the rare breed Zeeuwse melkschaap. Both kinds of cheese come from the islands in Zeeland, where the sheep graze on ocean-sprayed vegetation. Also try creamy Skaepsrond cheese, produced in Ransdorp, near Amsterdam. It looks a little like Camembert but has a milder, cleaner flavor. Dutch smoked cheese is melted, smoked, and then reconstituted into sausage-like shapes. It is usually sold in slices and has a distinctive brown rind and a smoky taste. Other varieties of Dutch cheese are smoked, but this is the only one with a distinctive shape. While blue cheese is not traditional in the Netherlands, the Dutch do make some excellent blue-veined Gouda cheeses. The most commercially available brand, called Delfts Blauw (also called Bleu de Graven) tastes rich and sweet, and not as salty as Roquefort. North Brabant-based organic brand Bastiaanse makes blue cheeses from both cow's and goat's milk. Bastiaanse Blauw cheeses are known for their pleasant creamy texture balanced with just a touch of nutty bitter taste. Also worth noting is Lady's Blue, an organic raw-milk blue cheese made from goat milk in the Drenthe province; it has a velvety texture and plenty of pep. This category includes cheeses (mostly Gouda or boerenkaas) that are flavored with herbs and spices such as parsley, chives, nettles, chili, mustard, and fenugreek. They each have a distinct flavor and are a simple way to add an unexpected nuance to cheese-based recipes. They are best in recipes that are simple and allow the cheese to shine, like a basic grilled cheese sandwich. Cheese markets are still held in Holland. Some are just for tourists, such as the Alkmaar, Hoorn, and Edam markets, but they are still a spectacle worth seeing. The traditional cheese market trade is re-enacted in these towns every summer in front of the gorgeous old cheese weigh houses. The ritual features cheese bearers donning straw hats, brightly colored wooden stretchers, and lots of cheese. True turophiles should also visit the Cheese Museum in Alkmaar. The cheese markets at Woerden and Gouda are the only remaining functioning commercial markets. Farmers from the area have their cheese weighed, tasted, and priced here. Cheese has been traded on the Gouda cheese market for over three hundred years. Buy some Gouda cheese there or peruse the many exhibitions related to cheese production surrounding the market. Woerden is the place to stock up on boerenkaas. Some farmers also open their farms up to the public for tours and tasting sessions. If you are visiting Amsterdam pop into Reypenaer's Tasting Room on the Singel, one of Amsterdam's old city center canals. Food-lovers the world over have long embraced Reypenaer cheese, an artisanal Gouda and a two-time Supreme Champion winner (best European cheese out of all categories) at the Nantwich International Cheese Show. Hungry to try these delicious cheeses for yourself? The following cheese shops have a respectable selection of Dutch cheeses and ship internationally.